U.S. Army Sgt. 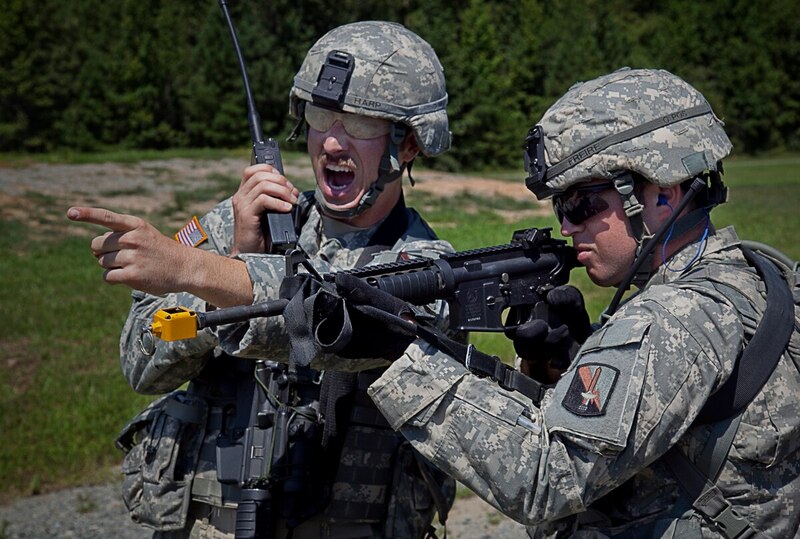 Sean Harp, 55th Signal Company (Combat Camera), wears dirt caked eye protection while communicating to his chain of command on his transmitter radio while Sgt. Matthew Freire, 55th Signal Company (Combat Camera), checks the iron sights on his M4 rifle in a field beside the launch pad of a CH-47 helicopter at Fort A.P. Hill, Aug. 9, 2011. Harp is the squad leader of the quick relief force and Freire is the squad leader of the first assault team waiting to load a CH-47 helicopter in order to clear a mock Afghan village during a 55th Signal Company (Combat Camera) field training exercise with weather that reached over 90 degrees. "Sergeant's time" is making a comeback. For old-timers, this would be a welcome return to NCOs leading their units, while officers take a backseat. For new soldiers, this would be a time to say: "Sarge, what the hell is sergeant's time?" It's a fair question, because the practice all but disappeared during 13 years of war. Sergeant's time was (and for a few units still is) a block of time set aside for NCOs — team and squad leaders, for example — to run their soldiers through small-unit tasks or professional development sessions. This could be a morning spent on the range working on marksmanship or a few hours set aside to practice using and communicating over Army radios. It could be counseling soldiers about finances or a training to react to a vehicle rollover. NCOs could lead soldiers through a session practicing combat casualty care or spend time talking about motorcycle safety. "There's a growing need for sergeants to want to take back training," Sergeant Major of the Army Dan Dailey told Army Times. This was very clear after 60 sergeants first class, master sergeants and first sergeants gathered in November for the NCO Solarium II, a 4-day sit-down at Fort Leavenworth, Kansas, to discuss issues facing the enlisted force. "Everyone in there unanimously said 'we want sergeant's time back. We want commanders to give us the time to train and educate soldiers,'" Dailey said. These soldiers are likely to get their wish. Sergeant Major of the Army Dan Dailey talks with troops from the 25th Infantry Division in Hawaii. Dailey is looking at how to restore sergeant's time in the ranks. Dailey told Army Times he will discuss it with Army Chief of Staff Gen. Mark Milley as well as other general officers and leaders as he visits installations across the Army. Milley himself, who has made readiness the Army's top priority, wants to forge more adaptive leaders, and sergeant's time has been touted as a way to do just that as it pushes NCOs to plan, organize and execute training. "We need to dedicate time to allow our sergeants to take back training, lead those young soldiers in individual and small-unit collective tasks, because when they get on the battlefield, at the point of contact with the enemy, those are the things that are really going to matter," Dailey said. And SMA has a strong track record for bringing NCO's good ideas to fruition. His best example: Helping kill the strict tattoo policy just two months after taking the top enlisted job. SMA does provide one caveat, however: "We're very leery of mandating things for leaders, because we can't make everything important." Sergeant's time used to be a staple across the Army. "In the '90s, sergeant's time was the law," Dailey said. "Every Thursday from 9-12, everybody did sergeant's time." Dailey said he doesn't think the Army needs to return to such a rigid timeline, but NCOs have told him they want some time, amid already busy schedules, to be protected and preserved. "Really, every day is sergeant's time," Dailey said. "But what they're asking for is can we create a standard where when commanders do their training calendar, can we dedicate this many hours, based on the commander's needs, to get sergeants the time they need to train on small-unit collective tasks?" Bringing back sergeant's time will not only give NCOs the chance to train their soldiers on small unit collective tasks, but it also will help build stronger teams and grow leaders' confidence, Dailey said. "It's a mature recommendation and important," he said. "It's teamwork, cohesion, it builds confidence in that young leader who's out there leading soldiers." Sgt. 1st Class Jason Hull, with 20th Chemical, Biological, Radiological, Nuclear and Explosives Command in Aberdeen, Maryland, volunteered for Solarium duty because it offered "a chance to have a voice," he said. He also knew exactly what that voice should say. "I came here with an agenda," he said. "Bring back sergeant's time." Units began drifting away from weekly sergeants time sessions — usually on Thursdays — as the wars in Afghanistan and Iraq picked up, Hull said. Since then, an already busy training calendar has even less wiggle room, making commanders unwilling to clear time for junior leader-led efforts. That's why "we wanted to elevate it to the strategic level, to make it a requirement that commanders have to find a place in their calendar," Hull said. "We need to build up our NCOs, make them better trainers. And that starts at the junior level. That's what sergeant's time is all about — junior NCOs training their soldiers." While not everyone dropped the training, those that did feel the effects during other unit preparation work, Hull said. "You'll do a major exercise and some of those skill level 1 and 2 tasks are being taught. That's not the time and place for it," he said. "That's where you should be honing your [standard operating procedures]. … You should be validating your training, not conducting it for the first time." The junior-level training "reinforces the bond of mission command," Hull said, allowing young soldiers to learn directly from their first-line supervisor and better appreciate his skill level and leadership ability. 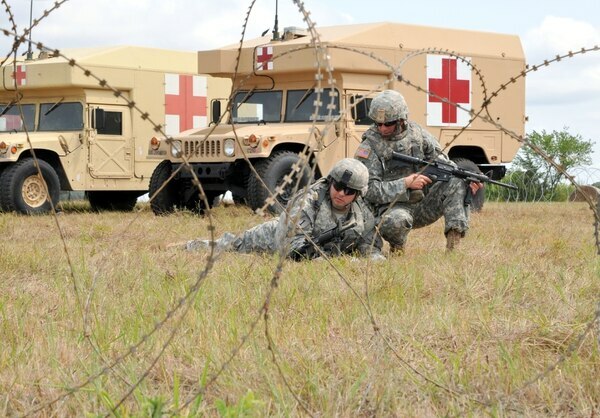 A sergeant offers one of his soldiers instructions on how to set up an effective security perimeter during a company field training exercise. NCOs would be able to tailor sergeant's time to the needs of their soldiers and unit. It's a bond that can work both ways. "It gives them ownership of their guys," Hull said of the NCOs. "If the platoon sergeant or the training NCO [is] always training everybody, if you're a junior NCO, you have no say over your soldiers. You don't feel that same ownership. 'Somebody else is going to train them. I don't have to worry about training.'" It also allows young NCOs to design and implement their own training policies — skills that will be necessary as they move up the ranks, and skills that may not develop if the NCO only enacts programs pushed down from higher-level leaders. Sgt. 1st Class Turon Logan, another Solarium attendee and a small group leader at the Army Medical Department Noncommissioned Officers Academy on Joint Base San Antonio, Texas, wasn't as insistent on carving out a special place on the calendar for junior-NCO leadership. "My personal belief is that every time is sergeant's time," he said. Junior-leader initiative has always been critical to force readiness, Logan said, and it's now even more critical for NCOs who want to move up in the ranks, as new evaluations limit how many top ranks can be handed out. "What I do want to do is, I want to take you to the woods, and before we actually get to the woods, I want to see you guys training on your team tasks. I want to see you as a team leader training your soldiers on his or her individual tasks, and then I want to see that squad leader come back and take all those individual tasks and combine them to that squad task," he said. The NCO Solarium II event took place Nov. 17-20 at Fort Leavenworth, Kansas. Participants in the event were 60 E-7s and E-8s who were selected by the Army's major commands; they must have had successfully served 24 months as a platoon sergeant or NCO in charge of a section. During the event, the soldiers discussed everything from online misconduct to training to professional development to counseling to the new NCO evaluation system. The persistent refrain during the Solarium was NCOs needed to step up and lead. That sentiment echoes what a group of squad leaders told Dailey earlier this year during the very first "Not in my squad" workshop. The group, which met in June, was made up of 32 squad leaders handpicked by their commands. 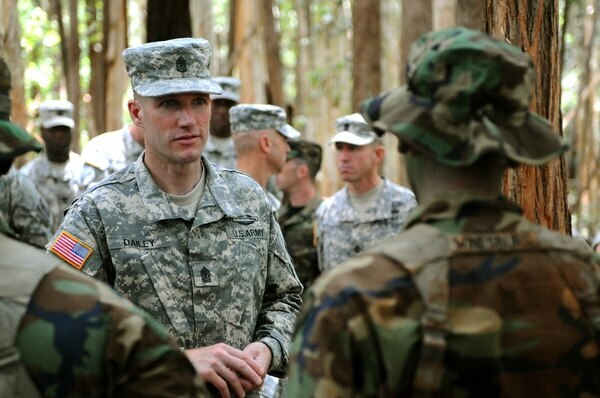 "Give [squad leaders] the time to conduct training," Staff Sgt. Nathan LeDoux, an advanced individual training instructor with the 246th Medical Battalion at Joint Base San Antonio, said at the time. "Give them the ability to take the initiative and solve soldier problems. Give them the opportunity to handle soldiers' issues and work on soldier development." "Not in my Squad," created by Dailey, is another NCO empowerment program that's focused on getting first-line leaders directly involved in issues such as sexual assault prevention, discipline, morale, training, standards, education, and the Army profession. Whether it's sergeant's time — Solarium recommendations called for 16 hours a month for active-duty units and 16 hours a year for the Reserve component — or other instructional efforts, some NCOs made clear that changes to the current training calendar would be difficult without a reduction in mandatory requirements. Another Solarium recommendation , provided to Army Times as part of briefing materials stamped "predecisional," called for a 50 percent reduction in mandatory training, and freedom for division and brigade leaders to "select and prioritize" from the remaining requirements. NCOs said senior leaders at the Symposium told them the issue already was being addressed, but that some of the training requirements, such as sexual assault prevention, are mandated by law and won't be going anywhere. Others address issues of high Army priority — suicide or substance abuse prevention, for instance. Hull said his training group didn't propose ditching those efforts, but tailoring them to where they are needed. "Some units have had historical issues of [such problems], and other units have never had an issue with it," Hull said. "We're not trying to take away the importance of it, but maybe the frequency." NCOs also addressed common complaints regarding computer training — a lack of hardware at some installations, and a labyrinth of databases soldiers must navigate to fill out the proper paperwork. Like other issues addressed by the 60 or so NCOs at the conference, training concerns weren't limited to the active-duty force. 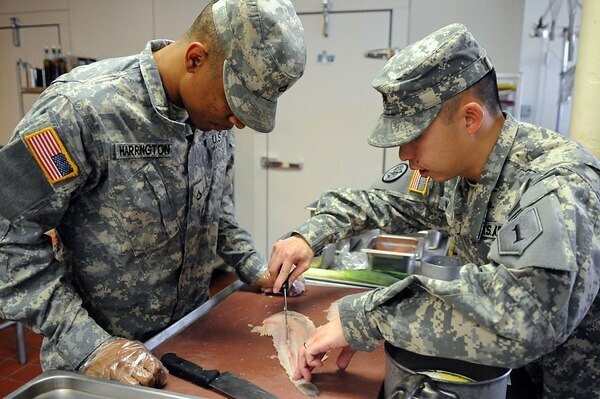 A sergeant shows a private first class how to fillet a fish. Many soldiers want to break back sergeant's time, a dedicated period in which NCOs lead their unit. "For the Reserve, we have our battle assembly weekend, that's what we technically call it," said Sgt. 1st Class Matthew Torres, an Active Guard and Reserve soldier with Army Reserve Command headquarters at Fort Bragg, North Carolina. "But [some NCOs] now call it an admin assembly — everybody sitting down, in a classroom. ... It is not battle training. … It just kind of reinforced that we're not doing that. "You have a soldier who was anxious, that saw all the commercials about joining the military, how they want to do stuff … but yet after [Advanced Individual Training], they get to their first unit, and everybody's sitting around, playing on their cellphones." Dailey said the Army is already looking at the recommendations that came out of the Solarium. "We've already started to delineate who has responsibility to take a look at these recommendations," he said. "We're going to take a look at each one of them." Events such as the Solarium are opportunities to get a diverse group of first-line leaders from across the Army to discuss ideas and recommendations, Dailey said. "You get some really good ideas from these things," he said. "What do you lose if you don't do it? You don't gain the pulse of the organization."